Today’s job market is full of downsizing and job cuts. There are plenty of qualified applicants for most positions, and employers have the option to be very picky. How can you compete with all the other jobseekers? One of the most effective ways to introduce yourself to an unknown employer is with a fine-tuned resume. With the help of our nursing resume templates, you can present your greatest strengths within just a few seconds of a hiring manager’s time. Use our resume writing tips to organize and perfect your personal document. Are you ready to get started? Why Use Nursing Resume Templates? Does format really matter that much? The truth is that a well-written nursing resume can open doors, and the most effective of those resumes tend to have similar qualities. As you seek nursing positions with community hospitals or clinics, you may find that basic nursing resume templates are the most appropriate. These templates are versatile from one industry to another and are well-suited to just about any career phase. Take a look at examples of lasting favorites with these popular and versatile resumes. If you’ve been in nursing for a long time and you’re ready to tackle a managerial or administrative position, the two-page format offers the space you need to include the pertinent aspects of your work experience, professional accomplishments, career achievements, and education. Make sure to tailor your information to the job requirements so you don’t make the mistake of adding too much fluff to the document. This may be your first time applying for a job, and maybe you don’t know very much about getting a job in the nursing industry. If you don’t have a lot of experience, entry-level nursing resume templates could be just what you need. These templates direct the reader’s attention to your skills and personal achievements rather than focusing on your lack of work experience. When you’re moving from one industry to another, you may face the difficult task of proving your worth in a new industry with examples from your unrelated work experiences. If this is the case, you may want to choose a resume with a focus on specific projects you’ve tackled and the skills you’ve honed that transfer well to the nursing industry. Check out our functional nursing resume templates. Some resume formats have passed the test of time, and traditional templates based on these formats contain important organization and presentation guidelines that won’t steer you wrong. If you aren’t sure which template is most appropriate for the job you want, go with a chronological or clean resume template. These straightforward templates are appropriate for nearly any job in most industries. Place your full name, email address, and phone number clearly at the beginning of your resume. Make sure you have a professional email address or voicemail greeting. Avoid outdated email servers, such as Hotmail and AOL. You can use your home address, but most employers don’t need your mailing address. Providing your city and state is usually enough. Be clear about the position you want to get. Outline some of the most impressive qualities you have to offer. Include keywords from the job description or the company website. Be sure you understand the differences between a summary and an objective statement. The summary statement quickly describes your value as an employee. It describes skills, accomplishments, and experiences that are beneficial to employers. An objective statement, on the other hand, talks about what you expect to gain from a job opportunity. Most employers and recruiters feel that objective statements are passé, but a few jobseekers, such as those hoping for entry-level positions and individuals who want to move into a new career path, could benefit from a well-written objective. Read through the job listing, noting keywords that are relevant to your skill set. Use the same type of language found in the job listing when describing your qualifications for the position. Create a resume for each job application you complete. Edit the content and language to appeal to the culture and goals of each company. Choose four to six of your most impressive skills to list. Begin with your most recent position and work backward through your previous employment. You shouldn’t have to go further back than 15 to 20 years. Provide information such as your previous job titles, the names of the companies you worked for, and the dates of your employment. Share three to five bullets that describe your responsibilities. List your degree or degrees, where you studied, and your graduation date or years of attendance. Provide information about relevant courses, training, and continuing education. • Choose one of the resume designs. • Provide a little bit of personal information. 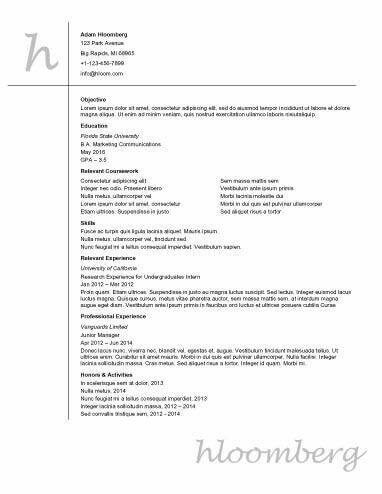 • Accept a carefully-matched resume template. Along with our help in creating a resume that should lead to interviews, you’ll have access to several helpful features. You may use these features to boost the impact of your personal document and improve your chances of gaining an advantage over your competition.